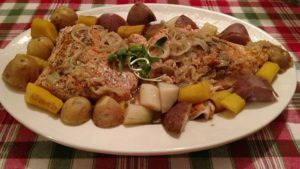 This is one of the easiest recipes I know for making salmon fillets. As we know, salmon can be steamed, baked or broil. Normally, I just season it, drizzle it with lemon juice and butter and cook it the oven. Quick and no mess. A lemon-butter sauce is a good way to go. You can see this in my post of 12/ 15/18 Poached Fish Fillets in Lemon-Butter Sauce, which can be applied to almost any seafood. But wine-butter sauce is another way to perfect this dish. Just note that salmon has a unique favor of its own that does not need enhancing with rich sauces and a plethora of spices. This masks the flavor of the fish. So, I prepare the dish with the basics: salt, pepper, and a little oregano. Add butter and white wine, and you have a marvelous seafood entrée. With some veggies and potatoes, and a light white wine (chardonnay, moselle, chenin blanc, suavignon blanc, pinot grigio, or, if you can afford it, meursualt). I had it with a rosé from Australia, North South Wales, a Yarrunga Field Rosé, and it was perfect. If you can get it, great. If not, the other choices work just as well. Rinse fillets under cold running water and oat dry with paper towels. Heat 2 tablespoons of the olive oil in a medium fry pan or skillet over medium-high heat. Add onion and sauté until translucent, about 2 minutes. Set aside. Season on both sides with the salt, pepper and oregano, patting the spices on the fish. Heat remaining 3 tablespoons olive oil in a large pan or skillet over medium-high heat. Add fillets, skin side up, and cook, uncovered, 2 minutes. Turn salmon over and cook 3 minutes. Add butter and wine to pan and cook, covered, until fish is opaque throughout and sauce is reduced, about 3 or more, depending upon thickness of fillets. Transfer to a serving platter, and drizzle sauce over fish when serving.